Tribal Africa, from the 16th and 20th centuries, did not have minted coins and paper money to use for trading. It became the custom to use brightly colored beads imported from Europe as currency in their transactions. In addition to the small seed beads that we are used to seeing, brightly striped and Millefiori patterned Venetian beads were and still are also very valuable to lovers of African beads. These gorgous beads are pictured in the bracelet above. 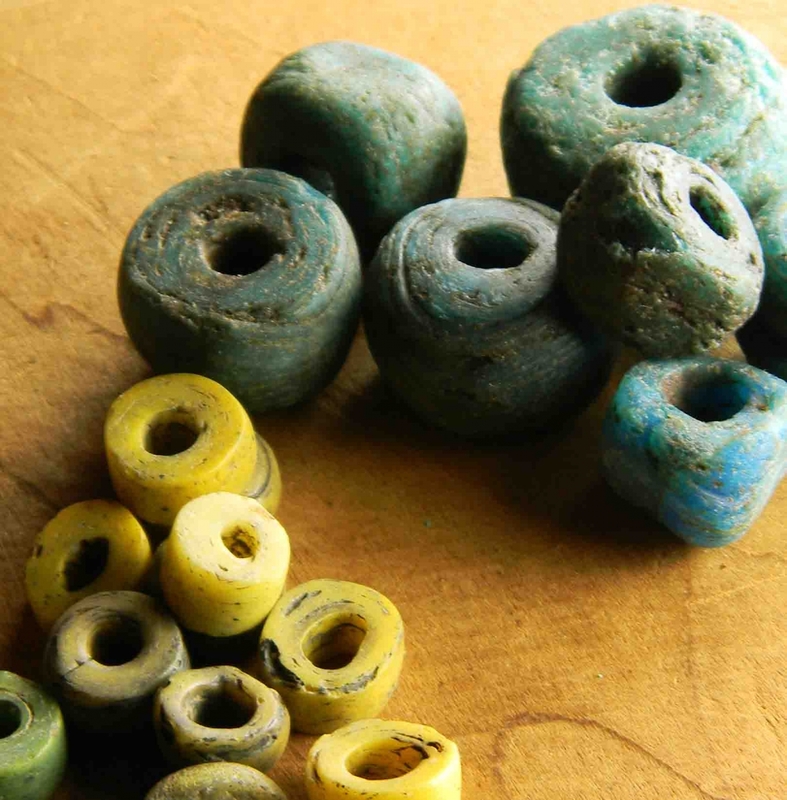 Larger Hebron beads, in yellow, blue and green are among the most highly prized glass beads, some going back to ancient times (see below). Old circulated Venetian beads in amazing colors that add so much to my designs. 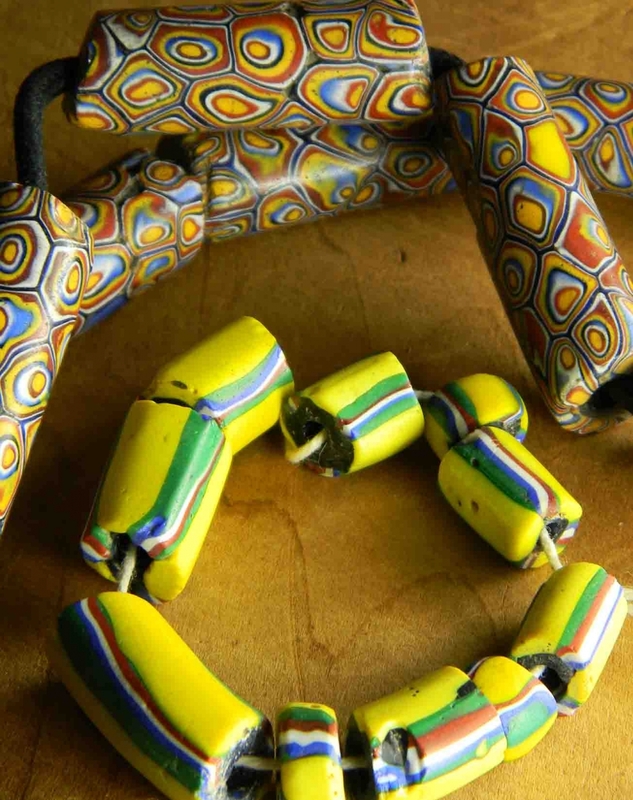 Brilliant yellow, blue, red and green, you can't look at African beads without being uplifted by the vibrant colors and patterns that intermingle so well with the brass metal beads that I like to use as accompaniments. 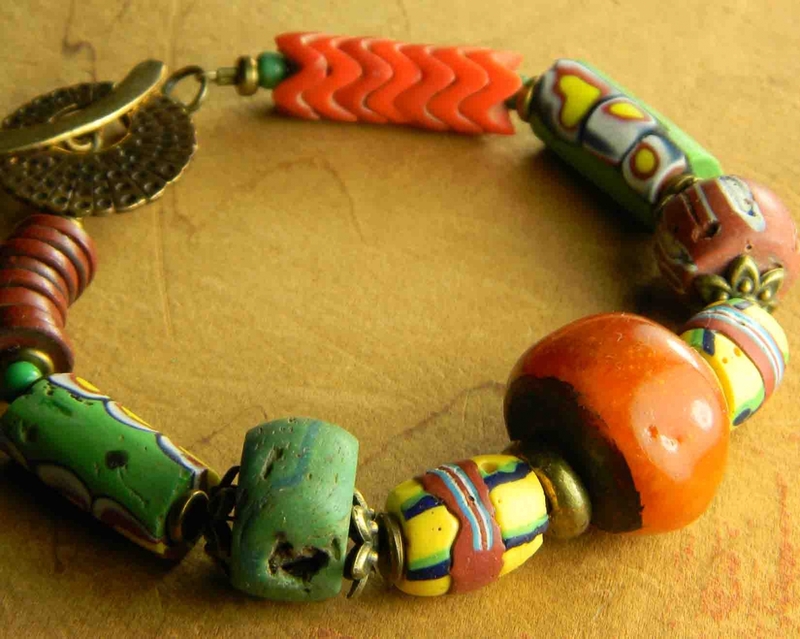 The brass and other metal trade beads are usually handmade in Ethiopia. Hebron beads, also called Kano beads, are made in Palestine, as were used primarily in the early 19th century. These glass makers have a fascinating history that goes back to 63 BCE when Romans occupied Palestine. These handmade beads were referred to as "coarse glass beads", made in a larger size called "Munjir", and a smaller size called "Hersh" or "Harish. The yellow color seems to be the most common, with the green and blue more rare. The Venetians were undoubtably the main supplier of beads that served as currency for the Europeans to the tribes, and for members of the tribes to use with one another. You see a multitude of beautiful patterns, each one maintaining a slightly imperfect primitive quality, that is to me what makes them so desirable. Again, you notice that this vibrant shade of yellow is a dominant color in many of the Venetian beads. Dark brick red and a beautiful shade of green are also commonly used in the Millefiori (1,000 flowers) floral motifs. 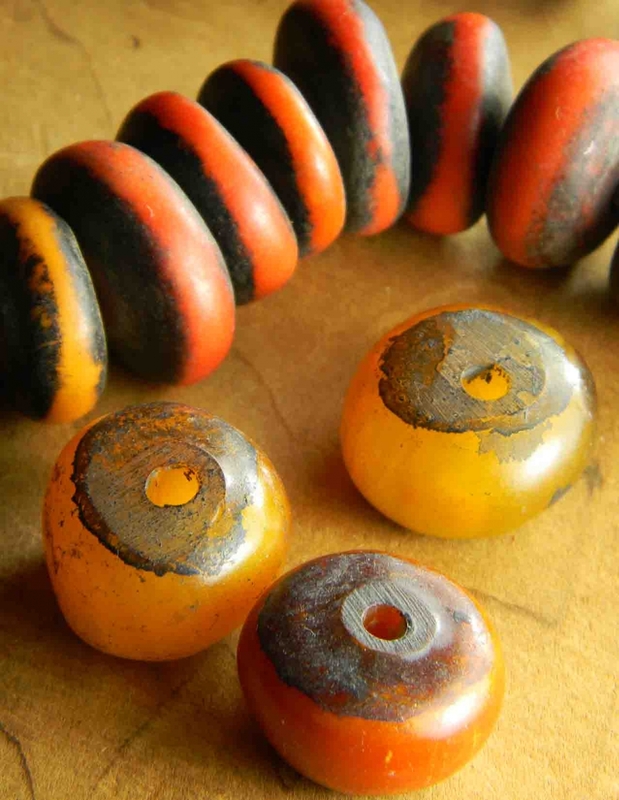 Amber and resin, mostly used by the nomadic Berber tribes of North Africa add contrast to the bright patterned glazed beads. Their natural color tones, and aged patina are have a warm quality about them, the main colors being orange, dark honey, and brown. The amber and resin beads offer different shapes than the tube glass Venetian beads, usually formed into round or large rondelles. I use all these and more in my African jewelry designs. 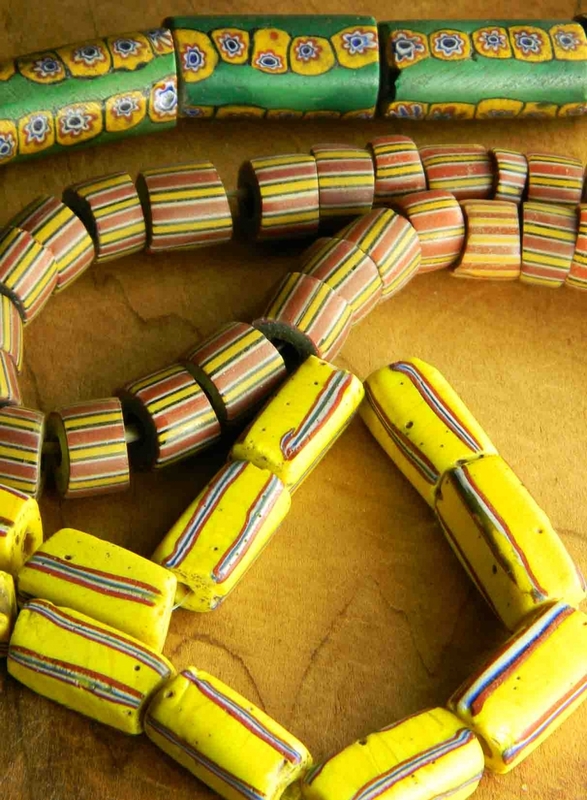 Constantly on the lookout for the most desirable patterns and colors, I have already amassed a considerable inventory of these authentic vintage African beads. So you will no doubt be seeing many new pieces featured in my web store in time for the holidays.